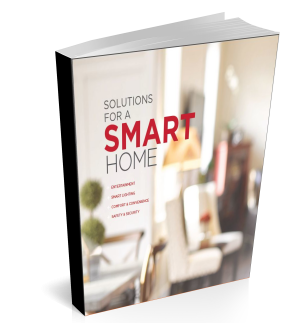 Managing your energy consumption – and your utility bills – has never been easier. In the summer, you can set your air conditioning to automatically turn off or adjust to a more energy-efficient temperature when no one is at home. Shades can also be lowered and drapes closed to keep out the sun’s burning hot rays. Come winter you want to capture the sun’s rays, so shades and drapes automatically open during the day to let the sun shine in. If you need some extra heat in one room, a smart fireplace can provide just the touch of added warmth to keep you cozy and snug even on the coldest nights. 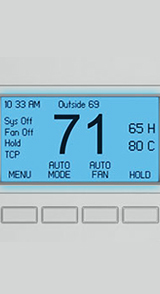 Control your climate from home or away. Stuck at work? You can easily adjust the thermostat levels in your home from your iPhone or iPad so the heat or air conditioning does not come on until you are closer to home. Or, if you awake in the middle of the night and need some extra heat – or a touch more cold air – you can make adjustments on your iPad or TV. Your feet never have to touch the floor! There is even a control for paddle-type ceiling fans with four speeds to incorporate into your heating and cooling schedule. Lifetronic Systems fully integrates dimmers, timers and occupancy sensors to additionally reduce energy waste. And in the case of fire, sensors automatically shut down the heating or air conditioning to contain smoke, while flashing lights outside make it easy for emergency services to locate your home.